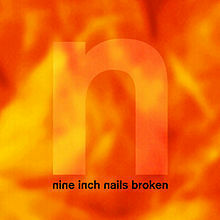 Broken is the Grammy Award-winning extended play release by American industrial rock act Nine Inch Nails, released on September 22, 1992. Produced by Nine Inch Nails frontman Trent Reznor and Flood, the EP is considerably heavier and takes influence from industrial metal and noise rock, rather than the electronica style of Pretty Hate Machine, which was oriented towards synthpop. Promotion of the EP was troubled. The music videos that accompanied 5 of the 8 total tracks were widely censored from television airplay due to their disturbing content. Nevertheless, "Wish" won the 1993 Grammy Award for Best Metal Performance and "Happiness in Slavery" in 1995. As part of the act's elevation to mainstream success, Broken debuted to generally positive reactions, and peaked at number 7 on the Billboard 200 chart. A companion remix EP, Fixed, was released in late 1992.